If you want to ensure the job is done right then it pays to get the very best cement mixer you can afford within your budget. Thankfully there are a number of cement mixers now available that will do a genuinely good job, and some can be bought at low price points. If you are a tradesman, the last thing you should ever think about is cutting corners and wind up getting a bad review all because the mixer you used wasn’t up to the job. A few extra minutes right now reading our top rated concrete mixer guide can help ensure you keep working week after week, and get that all important “thumbs up” once the job is complete. When you are undertaking building work and need to mix up a large amount of cement, a cement mixer will come in invaluable. These machines let you pop in the required amounts of sharp sand, cement and water to create the concrete you need. They are a great time saver and labour saver too. 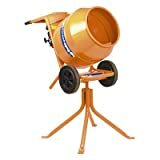 So which is the best cement mixer for sale in the Uk? One of our overall top rated cement mixers overall has to be the 120 litre Switzer cement mixer. 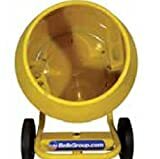 (Although Cement mixer perfectionists will state that a Belle cement mixer is one of the finest on the market. And they would be right, but they are also one of the most expensive). If it comes down to a budget then you can find plenty of brand new cement mixers for sale for around the £100 mark, and the prices increase for higher end machines such as a Belle cement mixer. Belle are renowned for being “the cream of the crop”, however you certainly don’t have to spend out £400+ on a Belle, although it would be a good investment. 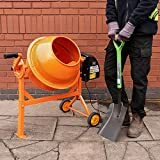 If it is a cheap cement mixer you are after then read on, as we have tested, worked and found what we believe to be the top 10 best concrete mixers at the current time. Consider whether you will need an electric cement mixer or a petrol mixer and you will then narrow down your best option based on needs and budget. Every one in this top 10 list has made it here by being better than the hundreds of others out there on the market. They are all “really” good however one of them edged out for us. Why bother with a cement mixer? This is probably fairly obvious, but if you’ve ever mixed together more than a few barrowloads of cement by hand on a board then you’ll quickly realize how slow, tiring and cumbersome it is. As one of the most used construction tools it serves a very important role to help work flow easily and ensure cement is mixed properly. It is far easier and more efficient to pop the materials into the mixer and leave it spinning. This lets you get on with the real work in hand. Which concrete mixer is best? There isn’t any REAL best mixer. Whichever cement mix you use, just make sure you follow the instructions and try to choose one that meets your budget and workload. Concrete and cement mixers are the same thing. They can be petrol or electric powered to serve your needs whether close to a power supply or out on a bustling building site. You can buy one and it will pay for itself within next to no time, or you could always use a plant hire company if it’s a one off small job. The Belle range of mixers are time served, well made and trusted by thousands of builders, but the downside is that they are more expensive than other brands. You get what you pay for though. Complete this with superb customer service and you’ll be glad you chose Belle. For the rest of the bunch, consider build quality and how often you’ll be using the mixer. If you are a small business then of course get the best you can afford. The 10 in this list are all GREAT. We filtered out the stuff that is not worthy and found these to be the best of the bunch. We particularly liked the Switzer models. Featuring the renowned Belle brand, superb construction in a semi-professional setup, your own DIY projects will be complemented perfectly by this electric powered Belle mini mix concrete mixer 230V. A very professional small cement mixer for sale to those who demand only the very best. 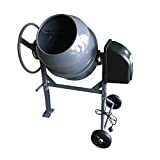 If you need a full barrow load of mortar or concrete then this cement mixer will handle it perfectly well and help keep you working constantly without having to wait for more mix to be made. 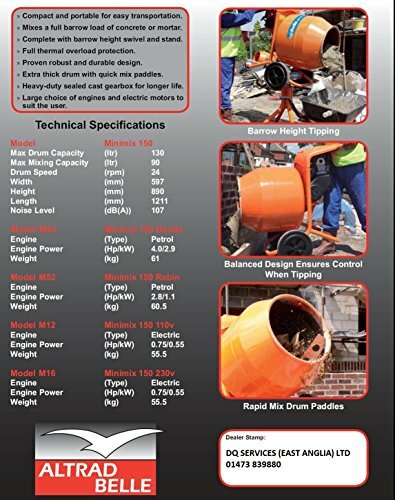 The Belle Minimix 140 230v tip up small cement mixer features an extra thick mixers drum with quick mix paddles and a tough construction. 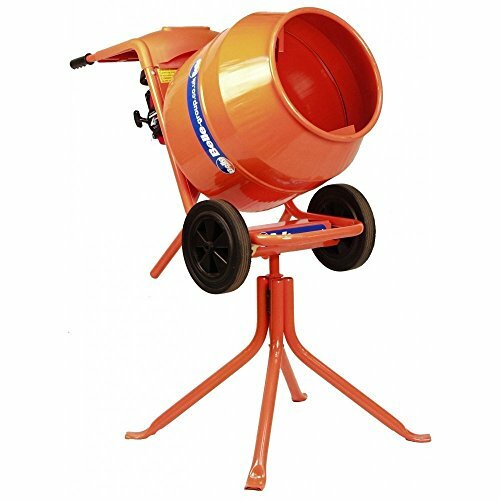 It comes supplied with Barrow height swivel stand however the mixer can be used on or off its stand and is the ideal portable solution for mixing concrete and cement. A little pricey but you get what you pay for. 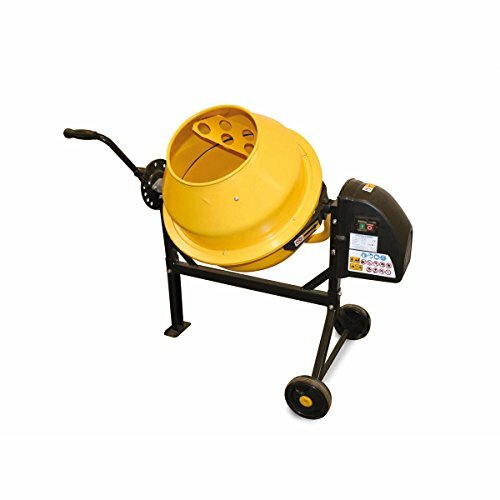 Belle offer some of the best cement mixers known so you can rest assured that a Belle purchase will leave you with a smile on your face. 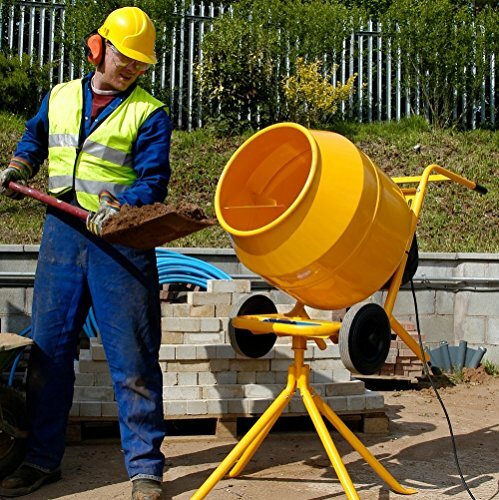 This 63 litre cement mixer is ideal for smaller jobs, but is equally effective at larger jobs. IF however you like the look of this, there is a larger sized 120 litre version for around £30 more here. While other cement mixers may boast huge 140 litre capacities, these mixer is good enough for most applications. It’s a tip up concrete mixer that works as hard as you do. 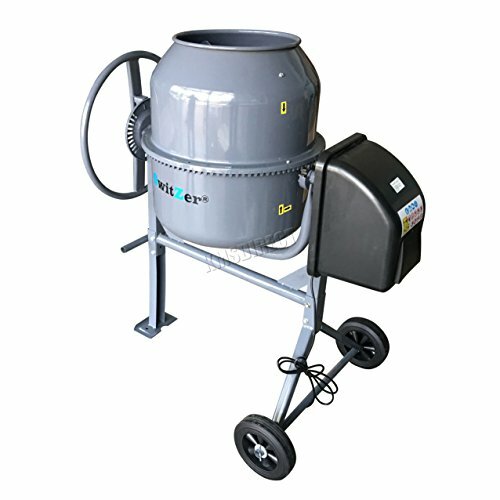 The progen cement mixer is ideal for concrete, mortar and plaster for most small to medium sized jobs. Highly rated by us – a great workhorse. Not ideal for large scale use where you need a lot of cement mixed up all of the time due to the smaller drum (be sure to check out the bigger brother here with a 120 litre capacity drum). 3: THIS JTF CEMENT MIXER GETS TOP MARKS! Yellow seems to be the new Orange, and why not. This 120 litre electric powered cement mixer is powered by a 550 watt engine perfect for all your mixing needs. It’s made by “JTF Mega Warehouse” and is typical of many similar generic products with lesser known brand names. Essential Chinese Imported. Thankfully you do get peace of mind with a UK supplier. This however does not detract from it’s build quality and reliability. Remember that all 10 in this list had to fight their way out of the swamp of poor mixers to reign supreme. 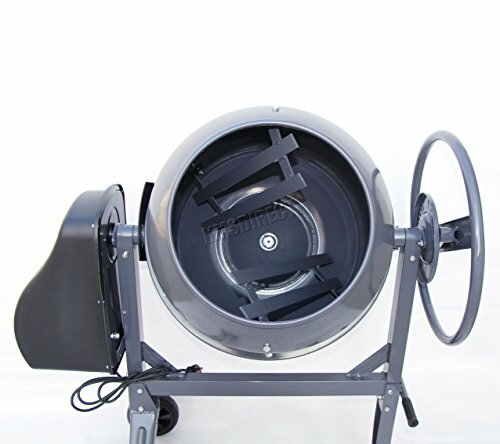 Great for smaller building sites it features a 39cm opening to the drum and rotates at 33 rpm. It can handle a 4 to 1 bucket mix just fine – just give it a little time to ensure the cement mix is right. It pours out into a bucket just fine. The only downside is thast the instruction manual is awful and probably for an older model – we wasn’t sure. This is a nice looking machine that works and functions as good as most of the other 9 in this list. However there “MAY” be an annoying let down with customer service, in so much as it might be hard to get a response. When we emailed, we actually got a response in under 10 minutes. In our research we found several people who have had shocking customer service and some people have gone so far as to blog about their experiences. You can read that here. I wanted to be clear and honest. Nice machine (and that is why it is in this list) BUT you may not get the help you want if you buy from them, although we are left thinking it may have been a temporary blip in their business growth where their customer service was poor, because more recent testimonials have come in showing customer service to be just fine (and highly recommended in some instances). Big enough to make a complete barrow load at a time. Our verdict is that it is actually a cracking little mixer that is brilliant for the DIY’er. Honestly, the pros of this machine definitely outweigh the con’s. It really is a great cement mixer and works tirelessly. There was at one point a momentary lapse in customer service skills (as far as we can tell) which doesn’t appear to be the case now though. 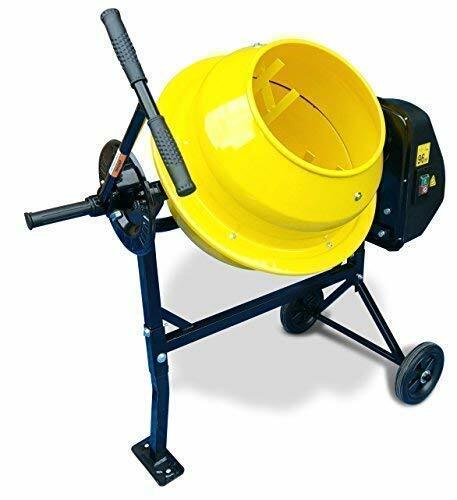 This hard working electric cement mixer is backed up by a 550 watt motor to help it work hard as long as you do. Upon opening we were very impressed by this large cement mixer! What’s it like in use? It does what you expect, and thanks to the larger drum size you can get more cement mixed at the same time. We used ours to lay the foundations for a concrete shed base and it worked tirelessly. Instructions could always be a bit clearer to follow but once it’s done then that’s it. 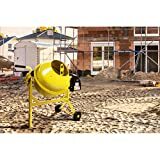 This JTF cement mixer represents a good solid 120 litre cement mixer backed up by a trusted Uk brand. 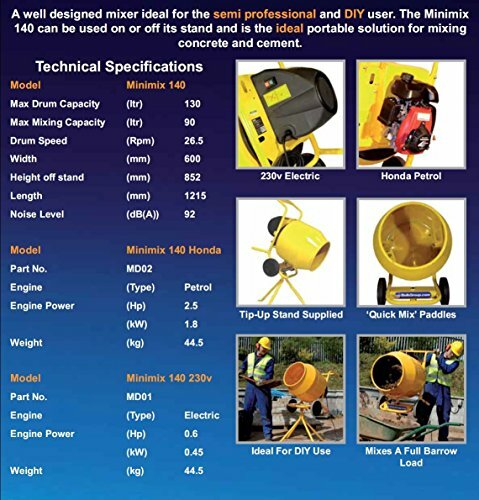 This 120 litre version concrete mixer is plenty big enough for the vast majority of jobs. The opening is 34cm (others in this top 10 are slightly bigger). It’s a doddle to use and operate, and the wheels make it easy to maneuvre too. 7: ONE OF OUR FAVOURITE CEMENT MIXERS HERE! 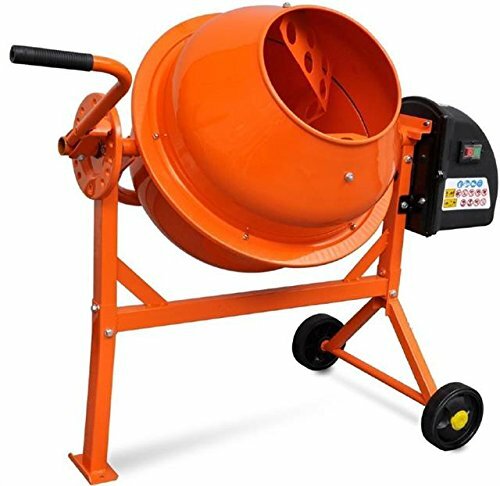 With it’s 120 litre capacity, the Switzer cement mixer boasts an uprated motor, and a wide opening, so you can throw in large amounts of cement or plaster etc for mixing. It is one of our most popular products for a reason. 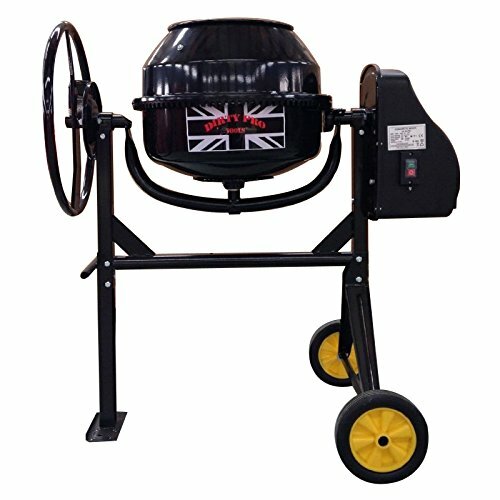 Still with the same great strong construction and powder coating, it’s tough and reliable and half the price of more well known branded “Belle Cement Mixers” (although Belle cement mixers are some of the very very best). It is certainly very well made and will easily make light work of many projects. 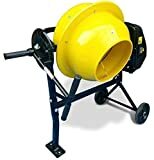 This is one of the recommended best cement mixers for sale. Cannot fault this at all! 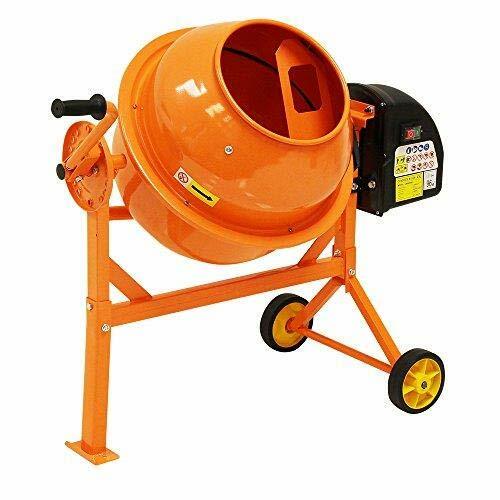 Here is the Belle minimix 150 electric cement mixer (without the stand). Lower in price than the model with stand, yet offers the same superb premium grade quality that can only come with a Belle mixer. No fluff, no hype, just one of the best work horses there is on the market. Powered by a 230v electric motor it is one of the toughest out. It’s an electric cement mixer with 150 litre capacity. Click to see if it’s available for delivery right away. If the best is needed without any hesitation then choose a Belle cement mixer and you’ll enjoy incredible and lightning fast customer service, brilliant high end perfectly formed machinery, and total peace of mind that your cement mixer will probably outlive you. Looking for a petrol cement mixer? Here is the Belle Minimix 150 petrol cement mixer that offers you the chance to work anywhere even if there is no electric power supply. It might not be the cheapest petrol cement mixer but it is without a doubt one of the very best. Being a Belle cement mixer, you get nothing but the very best. This is the full set up. Mixer, stand and petrol power source powered by a Honda gxh 4Hp engine. 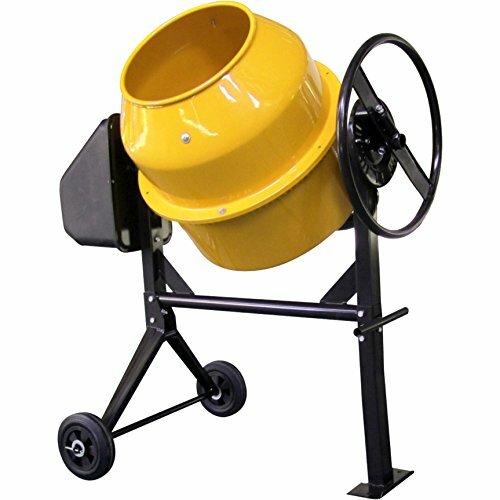 A superb cheap cement mixer! A cement mixer that fits any budget! 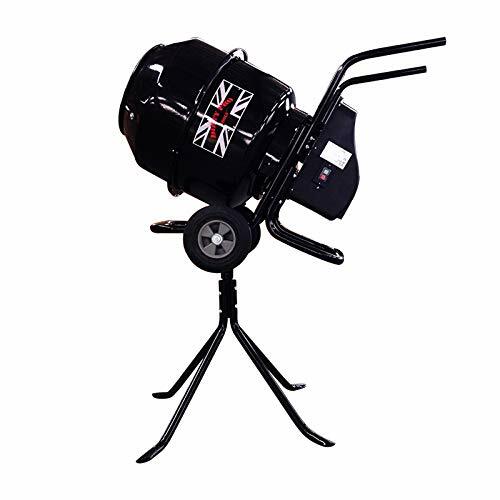 Priced just over £100 it’s superb value and just perfect for pretty much any job, however for large scale jobs such as house builds you might want a larger sized drum capacity. This one is 46 litres. Works well for laying patios, pathways and so much more! One of the cheapest cement mixers around! It makes no sense whatsoever now to hire out a cement mixer at £50 a time. Buy one of these and you will have made your money back with just 2 days of use! 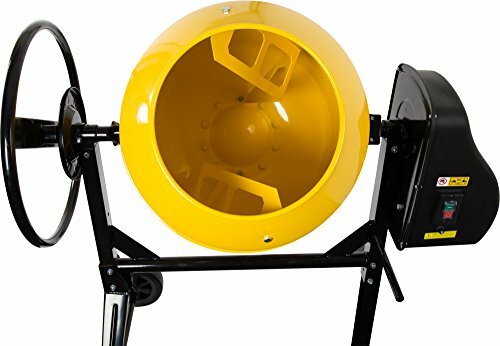 This cheap cement mixer for sale can be easily transported in the back of most cars! It’s great tipping handle makes it a doddle to pour out your mix where it’s needed or into a barrow. 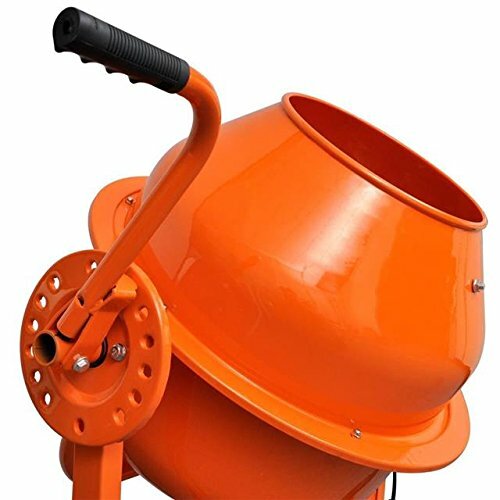 When looking for any kind of mixer you need to remember to choose the best cement mixer for your needs. Do you want something that is designed for heavy use 8 hours a day 6 days a week, or something more for occasional use – projects around the home? Remember, there are many cement mixers for sale..
All 10 of these in our list are “great” cement mixers. We have weeded out the poor performing cement mixers to leave this list of what is in our opinion the ones that are the most reliable, and good value for money. 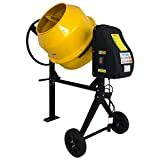 Any questions on the best cement mixers for sale? Have your seen our top 10 best wacker plates? Please comment below for our feedback! Here we work through a list to find out the top 10 best air fryer models currently available. When choosing an air-fryer, you have to consider it’s performance, it’s reliability, and how good it can cook food. Heart disease, strokes and diabetes aren’t just an imaginary thing. Over 100,000 people each year in the Uk suffer from a stroke from heart disease. That’s one person every 5 minutes. It’s really quite a daunting thing to think about. Your life on hold, held up and having to take things far slower, if you survive, that is. If you want to continue putting deep fried unhealthy food inside you then you are most certainly on a direct road to destination ill.
Make a conscious decision today to just change some of these habits. An air fryer cooks food with air (and sometimes a tiny bit of oil) and represents a far healthier way of deep frying food – and it tastes pretty good too. 1: OUR BEST BUDGET AIR FRYER! 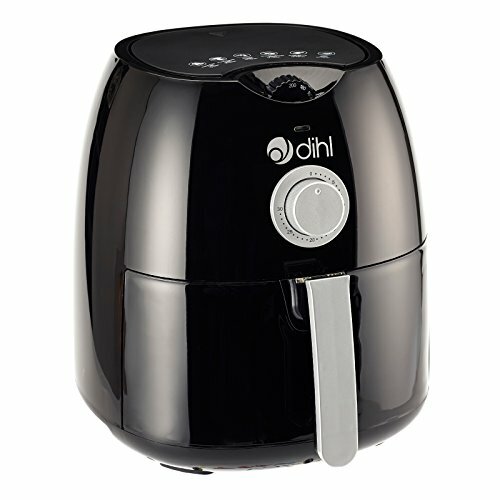 Our Dihl Air Fryer Review – definitely one of the cheapest air fryers to buy right now. It’s currently available in either Red or Black. 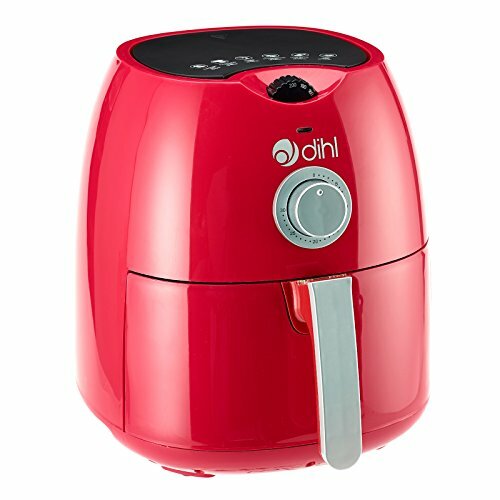 What’s NOT to love about the Dihl air fryer? For a start it’s a gorgeous rich red air fryer! It enjoys a whopping 4 litre cooking capacity – enough for more generous portions or for a bigger family. It even has a dishwasher safe tray so cleaning up is a simple as 1,2, 3 ! Join the Dihl recipes community and share recipes online! It measures 33cm high, 30cm long and 28cm wide. Features 1300 Watts of power making it a good performing machine that can stand well among more expensive air fryers. If you are looking for super low cost, brilliant looking and great capacity then this has to be one of the best budget air fryers currently available. Click here to find the current best price for this on Amazon. 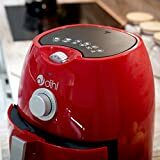 2: OUR SECOND BEST BUDGET AIR FRYER! It’s hard to put this as a second favourite budget air fryer because for over a year it was our number one favourite low cost air fryer. However even the best have to step aside sometimes. 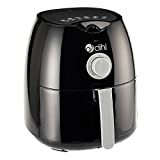 We are still madly in love with this air fryer (and use it day in day out, and it does really well), but the pricing is now not one of the cheapest, and secondly it’s capacity is only 2.2 litres whereas the Dihl is 4 litres. So it’s our number 2 for cheapest air fryer choices. Since we first created this article a year ago, we have updated it a few times, and time after time this air fryer has proven itself to be an exceptionally good budget air fryer. Sure it’s not perfect but for the money (under £70 typically) it does a really good job. Some manufacturers don’t really have to try and wow you with their sales patter because their products speak for themselves. This is the case with the Duronic AF1 air fryer. Offering a great first foray into air frying, the AF1 is available in both Black and White. How much can it cook? It has a 2.2 litre capacity which is enough for 2 to 3 people however with most air fryers you’re never going to squeeze in meat, veg, potatoes etc for 3 to 4 people. Remember it needs very little oil (If you need to go LARGE then look at the Dihl air fryer, or for super large look for the Vonshef 5 litre). With our own personal real testing we found we could make enough chips for 4 children in about 15 to 18 minutes. The Duronic AF1 uses air circulating technology on your food with little or no oil making food healthier without compromising on the taste. A small air fryer in size, but not in features or capacity – be prepared to be blown away! As far as air fryer offers goes, there is little need to look out for the best deals when this air fryer really does do a splendid job. Cooks just about every kind of food imaginable! Cook fish, sausages, bacon, burgers, make cakes, scones, doughnuts and many many more! For well under half the price of the premium branded models and with all the same great features you cannot go wrong. The AF1 has all the style charm and cooking capabilities you’ll need for most things. The only drawback is it is limited to 200 degrees so certain foods that require much higher temperatures may not be suited. The vast majority of foods are fine however. We love it’s hyper drive temperature display dial – it just makes you think you’re the captain of your own spaceship setting warp factor 10! The only real downside we consider (and it’s very minor) is that the basket may release from the tray IF you are carrying it from the unit over to a new counter top, AND you somehow managed to lift up the safety guard and press the basket release.. but it’s extremely unlikely so just take care where your fingers go. If this is your first time with an air fryer then this is definitely worthy of attention, as is the Salter air fryer (read our own review on the Ek2205 by Salter) and the Berg air fryer mainly for the price points and the larger capacities. Of course, a good air fryer wouldn’t be a good air fryer unless it had an “auto off” function and a sound timer to let you know when the food is done. This has both, so in pretty much every way you just have to decide if this is the style that would suit your kitchen the best. 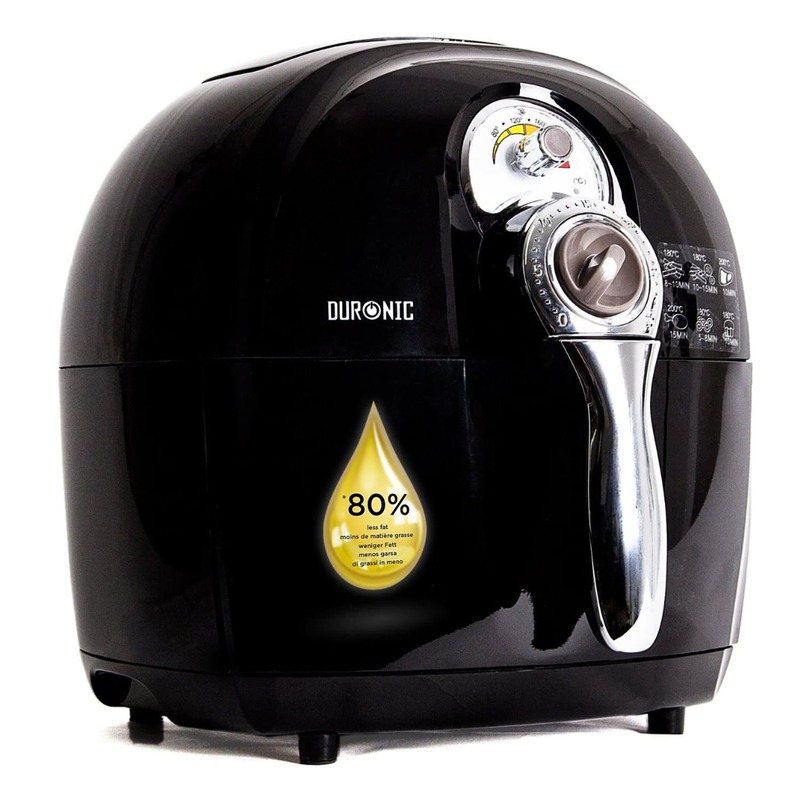 Click here to find the current best price for the Duronic air fryer on Amazon. 3: OUR BEST OVERALL AIR FRYER! Tefal Air Fryer Review – a rotating air fryer that has been used and trusted by millions. Did you know? – Over 7 million actifry air fryers have been produced… ! Read about it here.. Available is this, the 1.2kg capacity model, or you can change it to the traditional 1kg model when on the Amazon page for it. The traditional model is also a fair bit cheaper too. This Tefal Actifry is the latest version of what is arguably the best healthy fryer on the market – although everyone will have their favourite and own opinion, it is hard to beat the Actifry machine. This particular model is the latest and replaces an earlier traditional model. It’s a 1.2kg capacity electric air fryer. This means it can feed a family of four with ease. The best Actifry bar none. Feeds generously, looks superb and works very well. It’s not “oil free” – although frozen foods do not need any added oil. With this Tefal fryer you simply add a teaspoon of oil and that’s it – fried food without 99% of the fat! To be honest it is pretty much virtually odourless. With a teaspoon of oil you are not going to be bombarded with the smell of oil, so throw out any notions of traditional deep fat fryers and embrace the new! Traditional deep fryers cook the food in hot oil and the smell is instantly recognizable as “deep fried” whereas a hot air fryer circulates very hot air in a very clever way so that the food cooks evenly from all angles. Any more recipes for this? Yes there are hundreds online with a simple search or you can go to the Tefal website to download some more. What can you cook with the Tefal Actifry? Pretty much anything – as is the case for most air fryers. We are not just talking about fluffy crisp tasty chips cooked with 100 times less oil, we are talking curries, chilli con carne’s, frozen meats, roast meats, vegetables and so much more. Remember it’s also way more healthier than deep fryers! Here’s the link to those tefal recipes to look at (from an independent website), or direct from Tefal here. Although do remember that some of the best air fryer recipes are usually found on mom and pop websites or places like youtube. You might be interested to know that we are creating a resources for air fryer recipes here on 10 Warriors. If you fall in love with an air fryer you might just find yourself using it more and more and ultimately replacing your other cooking appliances when it comes to meal ideas. 1 Recipe book – so plenty of meal ideas to explore such as Chicken Tikka Masala, a vegetable stir fry and even Mediterranean style calamari recipes. 1 Instruction book to help guide you round it and how to use it. Pop your food in and add a spoon of your chosen oil then simply close the lid. The Actifry will cook at a constant 170 degrees C approx. All you need to do is set the timer – and the timer can be set up to 99 minutes. When done, you’ll hear an audible timer to let you know everything is done. Besides this 4 person version there is also a larger “family version Actifry that will feed up to 6 people (up to 1.5kg of food) – you can see that one here. Also, if you want to throw in some extra food halfway through (such as vegetables) you can do. Simply open the lid and the Actifry will pause the cooking to allow you access, and then simply resume where it left off right after you close the lid again. When you’ve finished, cleaning is just as simple – you can pop the removable ceramic coated pan, plus paddle and also lid straight into the dishwasher – so guess what? No hand washing needed. The Tefal Actifry is a tried, trusted and tested clear winner when it comes to healthy airfry cooking. The vast majority of people who own one of these have indicated they are extremely happy with it. What’s not to love about tasty healthier food with 100 times less oil, no smells and easy to clean? Easy to clean and no nasty fryer smells! Not really recommended for cooking doughnuts! Really and truly these are hard to beat. This air fryer review showcases one of the most successful air fryers to ever hit the market. The Actifry range uses a paddle that slowly moves the food round for even cooking whereas most others have the food in a pull out tray/basket or lift up tray/basket with an area below to catch drips. Nobody can argue about the benefits of healthier eating. After all if you could eat food that tastes stunning yet is immeasurably better for you – then it really serves up as a no brainer. Couple in the fact you can cook a mouth watering array of different foods and really there isn’t anything stopping you! If you need something a bit bigger then splash out a bit more and opt for the 1.5kg model (known as XL) as this will feed up to 6 average people instead of 4. There is also an Express model to consider. Want to find out more? You can by clicking here to see why this is one great air fryer machine! 4: BRILLIANT PHILIPS QUALITY AT A FAIR PRICE! This Philips digital airfryer (model number HD9621/91) makes cooking easier than ever. Switch on, food in, half a tablespoon of oil if desired and set the timer. AIR FRY.. GRILL.. BAKE cook whatever you want.. the options are endless with this VERY versatile machine. A Philip air fryer like this one represents a trusted and reliable device with a good warranty backup typically of 2 years. Philips legendary quality for peace of mind. Cook crispy Chicken in as little as 13 minutes! Stops cooking at the end of the time so no burnt food! Overall we really loved testing this machine. It is a beautiful machine that will happily grace the counter top of many a kitchen up and down the UK. Grill, bake, roast or fry – it’s your choice what you decide to do with this but the versatility is there at your disposal. We did have a little hesitation when we first opened the box. 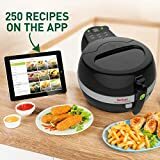 Instead of saying 100 times less oil (like the Actifry) they focus on the fact it enables you to cook in a healthier way that gives you 23% fewer calories when compared to a regular deep fat fryer. Yes, while a reduction is good, still 23% less calories is hardly groundbreaking (is it?). However we were initially looking at it wrong. We believe their marketing might have missed the point or benefits, although I’m sure someone from Philips would be keen to put us right! At the end of the day it is an air fryer and you can (if you want) pop in a tiny bit of oil. To ease our minds we wanted to know about oil use – namely how much oil is needed. For machines that are supposed to be far healthier than regular deep fat fryers we thought this was important to know. Actifry machines are touted as using “just a small amount of oil” whereas the marketing for this Philips hot air fryer is a little different. Philips focus on telling you other facts. Facts such as: 23% less calories. Their marketing suggests “oil free” as with most air fryers, however many recipes still suggest some oil can be added to change the taste to something more akin to what we “enjoy” (seemingly). Well, we decided to give this machine a go without any oil. In fact some of us gave the food a light spray with frylight and came to the conclusion that the food was still very nice. Kind of crispy on the outside and fluffy on the inside. A little like oven chips. So our conclusion of this machine is that for a start it is one of the best looking air fryers around. It cooks wonderfully. The timer let’s you know when cooking time is done and importantly the air fryer stops, meaning that your food won’t be overcooked if you are out out the room. Thumbs up from us! You can cook as healthy as you want. Removing all the oil is one of the best things you can do for your health however a small touch of oil or spray oil can be added to suit your taste, and you will still be cooking in a far healthier way. A third bigger than it’s baby brother at number 2 in our list, this Philips Airfryer XL HD9240/90 Avance collection airfryer. As for capacity, it is in fact 3 litres. This is big, but it’s certainly not the biggest around. Sure it’s bigger. It needs to be for the extra work it’s got to do. Size wise the footprint it will take up on your worktop is 42.3 x 31.5 x 30.2 cm – a nice corner would suit it. Compared to it’s baby brother though there is hardly anything in it size wise, just 3 or so cm on most sides so the additional counter top space taken up is hardly noticeable at all. Feel free to check out some of the amazing philips air fryer reviews over on Amazon. They speak for themselves. Even though XL, there’s no way it will feed a whole family with everything they need. Some items will need cooking elsewhere or placed in an oven while you cook the rest. The Philips air fryer price is somewhat higher than other air fryers but you may decide it is justified, knowing that it is really a top air fryer. It’s a beautiful machine and the larger size is definitely more welcoming but just bear in mind that if you are seeking to feed a family of 4 to 5 with say chicken and chips there won’t be enough room in this. In realistic terms you could probably cram in about 800g chips maximum but not a deal more. Otherwise maybe 7 to 8 chicken drumsticks or thighs in around 20 to 25 minutes. It DOES make for a great machine if you’re doing chicken and chips for 2 to 3 people – plenty of food, and you can mix your own home made chicken drumsticks with the chips in the same basket. HOWEVER in realistic terms, as long as you are aware this isn’t a total replacement for “all your cooking methods” you’ll be fine. Use it to cook maybe the most fattening foods in it, to keep the fat content low, and do the rest in the oven, in a saucepan or in the microwave. On the plus side, all of the above seems irrelevant when you actually get to grips with what you can cook with an air fryer. There are now thousands of recipes around for virtually any meal. Ever tried spring rolls or Moussaka cooked in one? Start experimenting and you’ll soon be cooking up an array of tasty treats and meals in next to no time. French fries? Why not. Add some Paprika to spice things up too! Click here to find the current best pricing on Amazon for this. One of our favourite oil-less air fryers on the market. Our mid priced “air fryer” in this list by a long mile and despite this it still passes many of our tests. We wanted to include this Tower T14004 air fryer because of it’s affordability and the fact that it looks just the part of a “proper” air fryer”. So, first of all, it’s surprisingly good looking (just as good looking as some of the more well known brands like Philips etc.). It does the job. A power air fryer that is extremely robust and hard working. Set and forget with the Tower air fryer. It features a timer that extends up to 30 minutes with a bell sound to let you know when the time has passed. It’s never going to be a high end Philips or Tefal, BUT for a mid priced air fryer its really good looking and it cooks food nicely as long as you follow the instructions carefully. Click here to find the current best price for this. The JML Air Fryer – heard of it? Next up we have the JML Jet hot air fryer. Perfect as an oil free air fryer for people on a budget. Ever heard of JML? Well they are the mastermind of “High Street TV”, and they are behind the hundreds of products you seen advertised on TV and in thousands of stores up and down the UK. They were established in 2008, and are based in Harrogate, Yorkshire. You can check them out here. It’s a dry air fryer with it’s own unique style – and that’s good to know! Fairly similar footprint to many other hot air fryers – large enough for the needed use, and small enough to fit in a nice place on your counter top. Open sesame, let’s cook some more food! Is this the perfect air fryer? Well, from a cost perspective it’s certainly competitive. The capacity of this device is 2.5 litres, which is fairly standard for an air fryer (the capacities cannot be huge as they need to be kept in a tight space for the air frying to be totally effective). We do have some minor reservations about the build quality, as in how long the lid will last. Pretty sure with a lot of careful use it will be fine but I wouldn’t like to be too heavy handed. Watch this video to see the benefits for yourself. It’s from an American infomercial however you can see the benefits in the first 5 minutes. For what it is, it’s a good unit. The unit is no longer listed on the manufacturers website, however it is actively sold in the United States. The customer services department do answer you when asking for replacement parts (i.e. lids) so for half the cost of other sleeker designs it’s certainly the unit to gain entry into the air fryer market. As long as you take care with the JML jet there is no reason why it cannot live happily in your home for a long time – as long as you like Lime Green. The handle colour is not available in any other colours. Click here to find the current best price for this air fryer. 8: THE BIG DADDY WITH AN ENORMOUS COOKING CAPACITY! Grab yourself a full WHOPPING 5 LITRES OF COOKING CAPACITY! The Vonshef 5 litre air fryer is now LOW COST and fabulous to boot! What is NOT to love about that? family sized, stylish and great at what it does. An 80 to 200 “degrees C” temperature range. Using a fryer without oil may seem strange, unconventional and yet a bit liberating at the same time. Suddenly you’re not just soaking everything in deep hot oil, but heating it using hot air that recirculates super efficiently. Pretty darned good we think. Click below to find the current best price for this. Just before we “dive in”, I wanted to add that this is technically not an air fryer – as in it’s not “frying” the food. Manufacturers are now releasing their Halogen ovens with convection units and infrared capabilities and calling them air fryers when technically they are not. At the end of this top 10 review list I will explain the differences between convection ovens, turbo broilers (which this is), and an air fryer. This is actually a Turbo broiler. Also known as an oven with infrared aided heat and a convection fan. So, that said, this machine is one one the funkiest looking units we’ve ever had the chance to review. It looks like a motorcyle helmet or some sort of futuristic spaceship perhaps? It is extremely handsome and would look incredibly cool in any kitchen. It also makes delicious healthy food. Even though it’s no “air fryer” it’s not to be dismissed as a healthy way to cook food, however you do need to be aware the food will not have that fried taste that true air fryers attempt to recreate (through “rapid air circulation”). These machines are merely heat with a convection fan moving the heat round – however a rotating spit with this model enables for a more even cooking experience compared to other “turbo broilers” like the Tower T14001. We ummed and arred for a long time, wondering whether or not to include this unit in this top 10 list of best air fryers as obviously it isn’t one. Turbo broilers (i.e. Halogen ovens with added infrared) are basically compact Halogen convection ovens with the added benefit of infrared. The downside is it simply isn’t ever going to fully attempt to recreate that fried food taste – which is kind of the whole reason for this review. I wanted to include two of these types of machine within this list so that you are aware of the differences between the two types of machine (there is a more thorough explanation towards the end of this top 10 list that explains the distinct differences). Sure, they are both healthier options and great machines, but a true air fryer will aim for that fried taste through rapid air circulation whereas these take their heat from a Halogen bulb and a fan that assists the flow. The rotating spit on this model takes it that step further in an attempt to remove the issues with Halogen ovens in that you do need to turn food making this model a very positive one. 10: STYLISH, CHEAP AND A VERY LARGE CAPACITY! Here is the Salter air fryer, the EK2205. Let’s see what the benefits and features of this unit are (taken direct from the Salter website). With over 20 years experience, the Salter brand is well established and known. A versatile alternative to deep fat frying, the Salter digital airfryer enables you to cook using little or no oil without losing any flavour. Featuring 1400 W power, the fryer can heat up to 200° and uses a heat circulation method in order to cook your food incredibly quickly. Ideal for home-made chips or wedges as well as meat, spring rolls, stuffed vegetables and quiche, it can cook a huge variety of meals. Brilliantly simple to use, it has a 30 minute timer with automatic switch-off, digital touch sensitive controls and an LCD display. It contains an easy to clean, removable 4.5 litre non-stick cooking basket which enables you to quickly serve the food after cooking. Why should I have this? It’s relatively cheaper than the high end Philips dry fryer and T-fal air fryer models, yet it looks every bit as good, AND it comes with the larger more generous capacity. What’s NOT to love about it? One of our favourites. The price point gives this air fryer a thumbs up, as does the extra large 4.5 litre capacity. It does what it’s supposed to and looks every bit as good as other main branded oil free air fryers so you can enjoy family portions of delicious healthy food (and a wide variety at that!) at a lower cost. After you’ve used it, it’s literally just the one pan to remove for cleaning which makes perfect sense when it’s your turn to do the dishes, or you can pop it in the dishwasher too, so it’s a win-win all round situation. Size wise it’s just about right so can be left out all the time, and it’s good looks contribute to it’s likeability. When 10 just aren’t enough, here are some additional air fryers that we wanted to give an honourable mention to. So it’s a good looking unit and seems to do all the things you’d want and the price is pretty spectacular as well (half the cost of mainstream branded products). It has an extra divider you can pop in to keep certain foods apart if you want. Featuring a 60 minute timer and temperature options ranging from 150 to 200 degrees – perfect for most foods. Features non slip feet and a cool touch handle. Overall an excellent machine and does what is intended. We couldn’t find any real genuine issues. Pop in the desired food, set the timer and wait for it to cook. Nothing could be simpler. Like most, it is recommended to shake once or twice throughout the cooking (especially when a lot is in, such as chips). 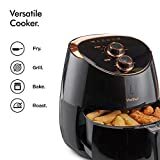 As an affordable good looking air fryer it is hard to find any faults with this and you won’t go too far wrong if this becomes your next purchase. Let us know your thoughts below. If you love this please share it, pin it or tweet it. Thanks!